Just regular folks. : Vince ear infection. Vince has an ear infection - I think one of the first ones ever. Our doctor's appointment was yesterday at 11 and we drive by a KFC on the way there and he asked if we could eat at KFC for lunch on the way back. 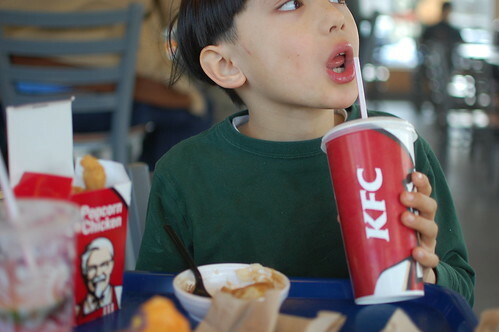 He has a fondness for KFC which stems from his formative years in Singapore where KFC is the dominate fast food restaurant because Asians prefer chicken over beef (aka McDonald's).